Do you ever feel misunderstood? Overlooked? Left out? Yeah, I think we all do from time to time. I have to admit I often feel these things. There are many times when I feel as if I don't fit in any category that we as human beings often sort people in. It's true, we have categories. You are in the married category, the parent category, the single category, the student category, the divorced category, the widowed category, and so on and so on. We have these distinctions. And they pretty much determine our friend groups and socializing habits. But what if you don't neatly fit into any one of those categories? And we are back to misunderstood, overlooked, and left out. I am sure we all feel misunderstood. The stay at home mom feels as if everyone thinks they sit at home and watch daytime tv all day. Ha! They don't. Homeschool parents may feel like everyone assumes they feed their kids granola and everyday is a field trip. It's not. Married without children ladies may feel like everyone is having babies, except for them. I feel like people assume I am desperate and upset about not being married at 27. I feel like people often speak in hushed tones in my absence about how they wish I could find a husband. I feel like I am looked at as a half rather than a whole. I feel like some people would take me more seriously if I were married. I feel like some people would be more comfortable around me if I were married. I feel like the topic of relationships is avoided in an effort to not make me feel bad. And worst of all, I feel isolated from friendship with ladies my age who aren't single. Misunderstood. Overlooked. Left out. Now hear me out, my objective here is NOT to make you feel sorry for me or anyone else who is single, pointing out all the injustices we face and demanding EQUAL RIGHTS FOR SINGLE PEOPLE! (Hey, that's a new one.) We have enough of our society demanding that privileges be rights and rights become privileges. But let me just correct some of the misunderstandings that I stated above. I am not desperate and I am not upset about being single at 27. This isn't a fake smile I wear. I don't cry myself to sleep at night and ask God, "Why haven't I found him yet?" To be honest, I have never questioned it. Because I believe that as long as I am following God's lead, He will take care of the details and arrangements. I am totally good with that. Yes, I do feel the whispers of people trying to think of someone, ANYONE, I may be a good match with. And that's fine if you need to problem solve in that way (grandma & grandpa), but you won't be solving my problem. Because I don't have one. You see, I don't see singleness as a problem. I don't see it as unfortunate. I don't see it as a shameful thing. Me being single says absolutely nothing bad about me; and if you are reading this and are single yourself, honey there is nothing wrong with you. As much as I don't consider singleness a curse, I also don't call it a gift as many self-help books may. I call it my location. You see I don't consider singleness my destination, if it was God would have laid that on my heart. But it is where I am at now, and I can enjoy the scenery from while I am here. I, as I am sure other singles, feel as if I am looked at as a half rather than a whole. Even not taken as seriously as a married lady would be. Hear my heart in this, you do not need to feel sorry for me, because I don't feel sorry for myself. However, I could recount many stories from my own life of times when I wasn't given a job, wasn't invited to a get together, wasn't thought of because of where I am in life. I vividly remember being declined a job opportunity because, "I would hate to bring you on here without any potential man for you." I think you can understand why I am okay with not getting that position. I guess people would be more comfortable if I were married. I haven't quite figured out why yet, but if you do, let me know! A more recent example of this happened when I ran into a friend from college at a public venue with his wife. If you know anything about the college I went to you would know the notorious side hug. I mean, it's what you do! Upon greeting my old fellow classmate he emphatically stuck out his hand for a nice, friendly handshake. I could have cared less about shaking his hand, I enjoy a good ole handshake. But it was the clear, calculated and intentionality of it that made me realize, he was uncomfortable. Finally, and most painful for me personally, is the feeling of isolation. I have found it difficult to sustain friendships, and even family relationships, that are important to me because I am in a different place in life. It breaks my heart when I have a better relationship with a friend's children than I do with my friend. (Just one of the wonders of kids. It doesn't matter who you are, if you will play with them and listen to them they're sold!) There have been many times when friends assume I am more interested in their children's lives than in their own. I really don't know what causes this gap. It could be the fact that I am not learning how to parent. It could be I don't have to deal with sustaining a marriage. It could be that I just don't get it. Whatever it is, I believe this gap that separates women needs to be closed. This whole single thing is a topic I do prefer to avoid, not because I am uncomfortable or upset by it, but because I don't want to be misunderstood. But the truth is we all share the same feelings, just about different things. You may not be in the single category, but each category has it's own areas of isolation. Single, married, kids, no kids, widowed, young, old, we all face our fair share of insecurities. 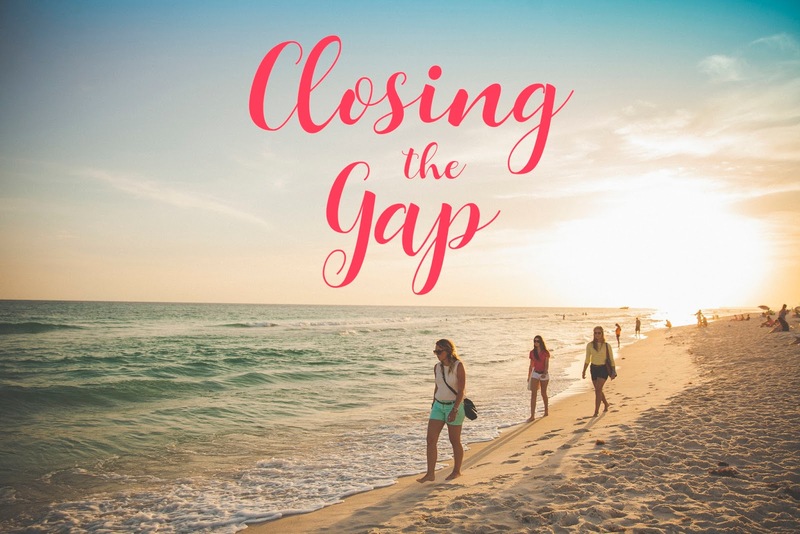 But all of those feelings of isolation and insecurities only widen the gap between us, when all the time God is calling us to close in those gaps. Bear with each other. We all long for connection and community. Those are just trendy ways of saying, we all want friends. We all need friends. But instead of just looking for women who are just like you, why not look for women you can connect with. Look for women who build you up and who you can build up as well. Look for them regardless of what "category" they live in, and when you find them work on closing that gap. Maybe you don't have firsthand experience with whatever they may be living through, that's okay! We are called to bear with each other in love. And let's be honest, sometimes we get worn out with people telling us how they did something. We don't always need someone to tell us how to get through a situation, we just need them to get through it with us. Forgive one another if any of you has a grievance against someone. Friend, maybe you have been hurt by someone who didn't understand you. Maybe you have been overlooked and left out. It hurts! I know it does. But we have got to forgive. I say we, because I have to too. There are people who have hurt me and they don't even know it! But how silly it is of me to walk around thinking about how they hurt me, getting hurt all over again. It doesn't change the way they have made you feel, and it may not change the way they will make you feel in the future. But it is the way that you can live in freedom and in love. Can I give you a little challenge? Find someone who is in a different stage of life than you are and love on them this week. Where ever they are at, spend time with them or just send them a message or text letting them know how loved they are and that you thought of them. Just knowing someone is thinking about you can be POWERFUL and make all the difference.